California farmers have made great progress in updating and modernizing irrigation technologies and practices. For example, in 1990, more than two-thirds of California crops were flood irrigated. By 2010, that number had declined to 43% and is likely even lower today. During that same period, the percent of land irrigated with more efficient microsprinklers and drip irrigation increased from 15% to 38%. These improvements are one of the reasons that California remains among the most productive agricultural regions in the world, producing more than 400 different farm products. Note: These data do not include rice acreage, which is grown using flood irrigation. 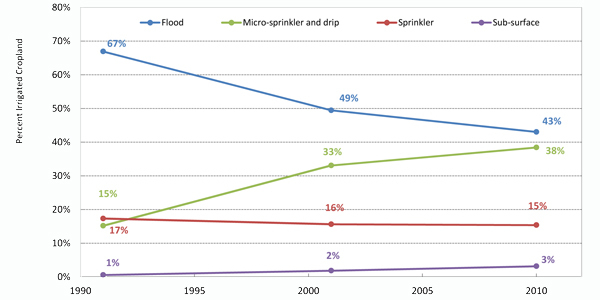 If rice acreage were included, the percent of crop land using flood irrigation would be higher. Source: G.N. Tindula, M.N. Orang, and R.L. Snyder. 2013. “Survey of Irrigation Methods in California in 2010,” ASCE Journal of Irrigation and Drainage Engineering 139: 233-238. But despite past efforts, great untapped potential remains to use water more efficiently. Water efficiency – defined as measures that reduce water use while maintaining the benefits water provides – has been shown to be a cost-effective and flexible tool to adapt to drought as well as address longstanding water challenges in California. Moreover, today’s investments in efficiency will provide a competitive advantage in the future and ensure the ongoing strength of the agriculture sector in California. 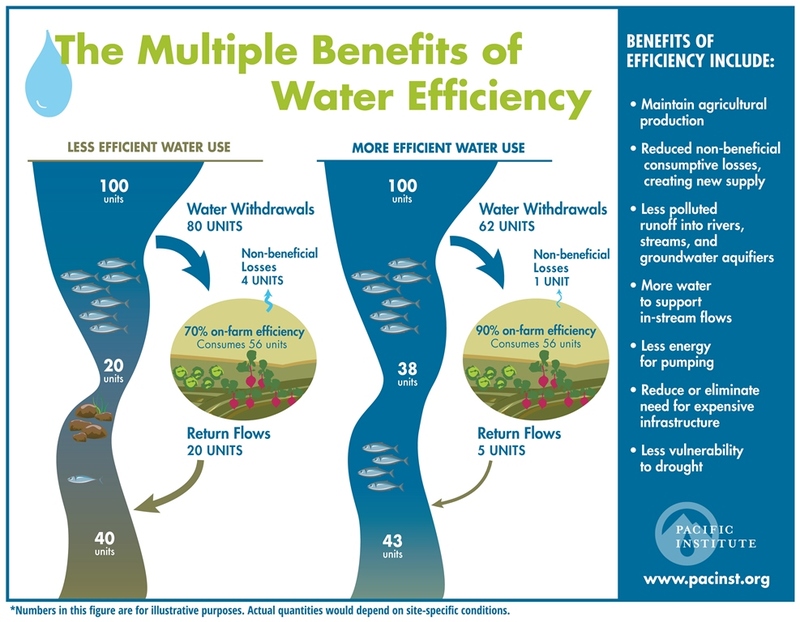 Water-efficiency improvements provide multiple benefits. Some of the water saved represents new supply that can be dedicated to other uses. Efficiency improvements that do not produce new supply provide other important co-benefits. A new fact sheet and infographic describe some of these benefits, e.g., helping farmers maintain and even improve agricultural production; reducing the discharge of polluted runoff into rivers, streams, and groundwater aquifers; and providing more water to support instream flows. An improved understanding of these benefits, and the strategies to achieve them, expand the portfolio of policies that can be applied to solve key issues of concern in California, including water-supply reliability, conflicts among water users, the risks of droughts, worsening water quality, and ecological degradation. Click the infographic for full-sized view. I appreciate the opportunity to have read this and I will reflect upon it and I’ll check back in the future, to see what other readers are saying about the subject.